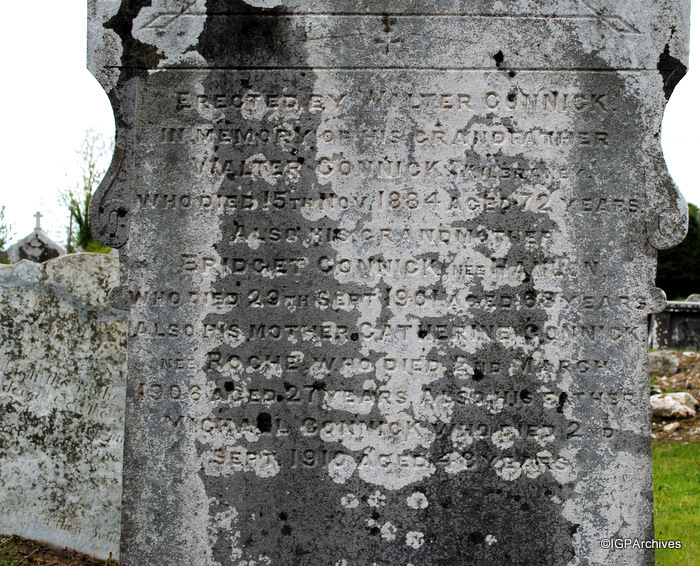 wexford-ballyanne-rc -- Erected by WALTER CONNICK | in Memory of his Grandfather | WALTER CONNICK Kilbraney | who died 15th Nov 1884 Aged 72 years | Also his Grandmother | BRIDGET CONNICK nee HANLON | Who died 29 (? )th Sept 1901 Aged 68 (?) years | Also his Mother CATHERINE CONNICK | nee ROCHE who died 2nd March | 1906 Aged 27 years. Also His Father | MICHAEL CONNICK who died 2nd | Sept 1910 Aged 48 Years.